The Malayan Emergency was the colonial government's term for the conflict. The Malayan National Liberation Army termed it the Anti-British National Liberation War. The rubber plantations and tin mining industries had pushed for the use of the term "emergency" since their losses would not have been covered by if it had been termed a "war." 2nd Lieutenant Michael Kimmel of the Devonshire Regiment. Educated at Sandhurst. Born in 1929. Died of wounds 13 April 1950 aged 21. Buried in Cheras Road Christian Cemetery, Kuala Lumpur. Captain George Skelley of the Devonshire Regiment. Died in a vehicle accident 26 March 1918 aged 44. Buried in Kranji Military Cemetery, Singapore. 14453313 Lance Corporal Ernest Banton of the 1st Battalion, the Devonshire Regiment. Born in the June Quarter of 1918. Died in operations 5 December 1949 aged 30. His remains were repatriated. 22192164 Private D. Bone of the 1st Battalion, the Devonshire Regiment. Born in 1930. Died in operations 6 June 1950 aged 20. Buried Cheras Road Christian Cemetery, Kuala Lumpur. 19035505 Private Joseph M. Browne of the 1st Battalion, the Devonshire Regiment. Born in Mansfield in the December Quarter of 1928. Died in operations 5 April 1949 aged 21. Buried Cheras Road Christian Cemetery, Kuala Lumpur. 22222120 Private George H. Coomber of the 1st Battalion, the Devonshire Regiment. Born in Dewsbury in the December Quarter of 1921. Died in operations 8 December 1948 aged 27. Buried in Kranji Military Cemetery, Singapore. 22200811 Private John Gardiner of the 1st Battalion, the Devonshire Regiment. Born in Bristol in the June Quarter of 1930. Died in operations 11 March 1949 aged 19. Buried in Kranji Military Cemetery, Singapore. 21015058 Corporal Francis ("Frank") Morrish Glass of the 1st Battalion, the Devonshire Regiment. Born in Barnstaple in the December Quarter of 1913. Killed in action 28 February 1949 aged 35. 22169094. Private Michael J. Greene of the 1st Battalion, the Devonshire Regiment. Born in Bristol in the June Quarter of 1931. Died in operations 10 September 1950 aged 19. Buried Cheras Road Christian Cemetery, Kuala Lumpur. 21045212 Private George C. Hall of the 1st Battalion, the Devonshire Regiment. Born in Neath in the June Quarter of 1920. Died in operations 27 July 1949 aged 29. Buried Cheras Road Christian Cemetery, Kuala Lumpur. 19190565 Private W. G. Lawrey of the 1st Battalion, the Devonshire Regiment. Born in 1930. Killed in operations 6 May 1949 aged 19. Buried Cheras Road Christian Cemetery, Kuala Lumpur. 22204737 Lance Corporal Reginald W. Price of the 1st Battalion, the Devonshire Regiment. Born in 1923. Died in operations 13 June 1950 aged 27. Buried Cheras Road Christian Cemetery, Kuala Lumpur. 14996779 Corporal John Rayner of the 1st Battalion, the Devonshire Regiment. Born in the September Quarter of 1921. Born in the September Quarter of 1921. Died in operations 10 March 1949 aged 27. Buried Cheras Road Christian Cemetery, Kuala Lumpur. 21025060 Corporal David Roe of the 1st Battalion, the Devonshire Regiment. Born in Kingsnorton in 1905. Died 11 October 1948 aged 43. Buried in Kranji Military Cemetery, Singapore. 21073224 Private Kenneth A Sysum of the 1st Battalion, the Devonshire Regiment. Born in Gloucester in the December Quarter of 1929. Died 6 February 1949 aged 19. His remains were repatriated. 22222387 Lance Corporal Reginald M. Vizor of the 1st Battalion, the Devonshire Regiment. Born in Malmesbury in the September Quarter of 1926. Died in operations 18 June 1949 aged 23. Buried Cheras Road Christian Cemetery, Kuala Lumpur. 19155292 Private Lionel M Ward of the 1st Battalion, the Devonshire Regiment. Born in Totnes in 1929. Died in operations 28 March 1948. aged 19. Buried in Kranji Military Cemetery, Singapore. 22188382 Private Dennis J Wareham of the 1st Battalion, the Devonshire Regiment. Born in Ormskirk in the December Quarter of 1932. Died in operations 25 May 1950 aged 18. Buried Cheras Road Christian Cemetery, Kuala Lumpur. 19195818 Corporal Norman Weyman of the 1st Battalion, the Devonshire Regiment. Born in Alverstoke, Hants in the June Quarter of 1928. Killed in action 20 February 1949 aged 35. Buried Cheras Road Christian Cemetery, Kuala Lumpur. 14193768 Private Alfred J Wonnacott of the 1st Battalion, the Devonshire Regiment. Born in Newton Abbot in the June Quarter of 1922. Died in operations 29 August 1948 aged 26. Buried in Kranji Military Cemetery, Singapore. Our total number of men does not coincide with that on the Memorial but we have included all those we found. The Mau Mau Uprising (also known as the Mau Mau Revolt, Mau Mau Rebellion and the Kenya Emergency) was a military conflict that took place in Kenya between 1952 and 1960. It involved a Kikuyu -dominated anti-colonial group called the Mau Mau and elements of the British Army and auxiliaries and anti-Mau Mau Kikuyu. 22761333 Private Philip Hugh Badcock of the 1st Battalion, the Devonshire Regiment. Born in Swansea in the June Quarter of 1926. Killed on operations 20 November 1953 aged 27. Buried in Nairobi Park Cemetery. 22691274 Private John Frederick Foyle of the 1st Battalion, the Devonshire Regiment. Born in Birmingham 24 December 1933. Killed on operations 19 May 1953 aged 20. Buried Nanynki Cemetery. 22547700 Lance Corporal Charles Emerson of the Army catering Corps attached to the 1st Battalion, the Devonshire Regiment. Born in Darlington 23 June 1928. Died on operations 11 September 1953 aged 25. 22652621 Lance Corporal Derek Victor Leaman of the 1st Battalion, the Devonshire Regiment. Born in Newton Abbot 29 January 1934. Killed on operations 10 November 1953. Buried in Nairobi Park Cemetery. 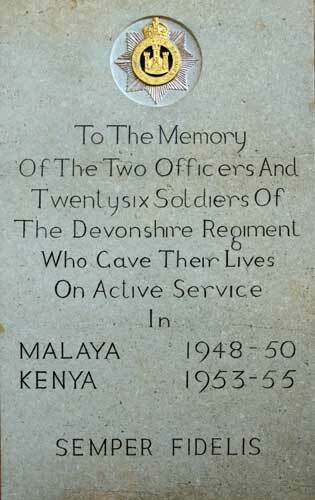 22716619 Private Alan Mullan of the 1st Battalion, the Devonshire Regiment. Born in Bristol 26 Jul 1934. Accidentally killed 29 June 1953 aged 19. Buried in St. Peters Cemetery Nyeri. 22751202 Private Henry Charles Douglas Newman of the 1st Battalion, the Devonshire Regiment. Born in Newbury 18 October 1932. Died on operations 8 June 1953. Buried in Nairobi Park Cemetery. 22751204 Lance Corporal Peter Colin O'Flynn of the 1st Battalion, the Devonshire Regiment. Born in Uxbridge 4 June 1934. Killed on operations 2 January 1954 aged 20. Buried in Nairobi Park Cemetery. 22761345 Private David Charles Page of the 1st Battalion, the Devonshire Regiment. Born in Romford, Essex 21 May 1934. Killed in a motor cycle accident 14 July 1953 aged 19. Buried in Nairobi Park Cemetery. 22703672 Private Royston Reginald James Sarahs Born 5 August 1931. Died of wounds received during operations 11 February 1954 aged 23. Buried in Nairobi Park Cemetery. 22855789 Private Malcolm Tuffley of the 1st Battalion, the Devonshire Regiment. Born in Chepstow 28 October 1934. Died of Disease 18 January 1954 aged 20. Died Mbarki Cemetery, Mombasa.